Welcome to Emmy Cooks! You can see some of my favorite recent recipes by clicking the “My Favorite Recipes” category on the sidebar (here are May, June, and July). If you like what you see here, you can sign up on the sidebar to receive a daily recipe by email, or follow Emmy Cooks on Facebook, Twitter, or Pinterest. It took us 11 hours to get out of the house today. Does that happen to families that don’t have little children running around everywhere? I can’t remember. I don’t think so. There was playing to do in the back yard, the baby wanted to be rocked while she slept, and the bigger kids took long naps in the late afternoon. Meanwhile, we picked through our blueberries (tiny snails were hiding in their blossom ends) and got a pot of blueberry jam simmering. The children tasted it many, many times. It doesn’t sound busy, does it? Today, it was all-consuming. We got to the park with all our bikes and scooters in the evening, just in time to ride the lakefront loop and have a picnic dinner on our girls’ favorite hidden beach at sunset. We had a very good salad. It was that lime-drenched Summer Crunch Salad with Feta and Mint, have you been making that? I can’t get enough. I’ve been making it all summer. Tonight’s combination included romaine, radishes, sweet corn, and a fresh Walla Walla onion. So good. Anyway, you already have that recipe, so let’s move on. Bittman’s praise of the tomato-and-peach combination is richly deserved, and nectarines and tomatoes are an equally delightful combination. I used nectarines this time because they were sweet and perfect at the moment I wanted to make this salad. You can use whichever fruit you like. 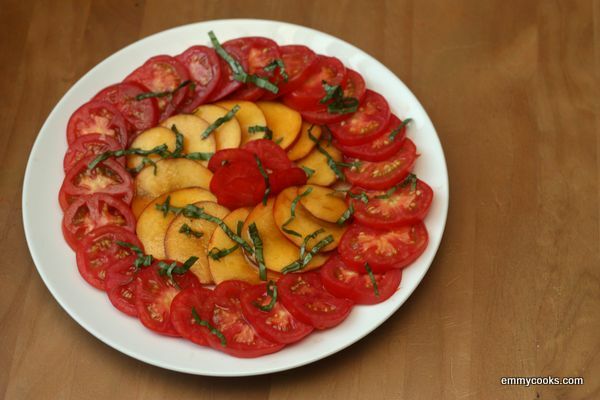 Tomato and Nectarine Salad with Basil: Choose a few fragrant tomatoes and nectarines and cut them into similar-sized slices or wedges. Drizzle with olive oil and sherry vinegar and shower with thinly-sliced basil. This entry was posted in Food, Fruit, Recipes, Salads, Vegan or Would-Be-Just-As-Good-Vegan and tagged mark bittman has lots of good ideas, summer cooking, summer CSA recipes, tomato salad, tomatoes and nectarines, tomatoes and peaches on August 11, 2012 by emmycooks. It can take people without children a bit to get out of the house. I can be sitting in the car and my husband stops to look at the mail,LOL. That doesn’t please me but it happens. This salad sounds delightful. 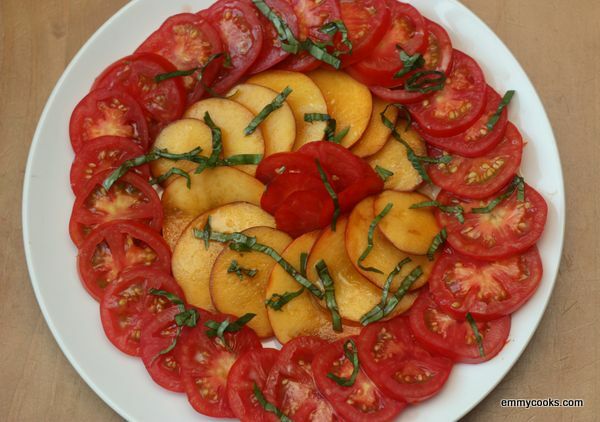 I have never paired nectarines with tomatoes but why not. Lovely presentation. Yum, I bet this is great! And it looks beautiful, too. I love the basil and nectarine combination. Nectarines and tomatoes??? Unusual indeed! I have everything I need for this salad – can’t WAIT to try it. It was meant to be! Another combination I liked recently was tomatoes, sweet cherries, and basil with a balsamic reduction drizzle–yum! Something about those sweet fruits and tangy tomatoes is just great. Enjoy!